We used 20 years of plot data to analyze the influence of tree growth-mortality balance and species mix on the potential of old stands to sequester carbon from the atmosphere and store carbon. 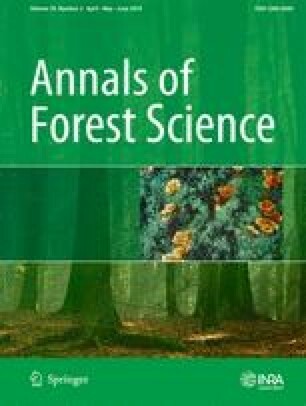 The study indicated that carbon in hardwood-dominated stands increased with age, without any sign of decline in carbon sequestration. In contrast, balsam fir ( Abies balsamea (L.) Mill.) dominated softwood stands showed a negative C change with a decline at 80 years of age. Variation in species stand development, carbon (C) storage, and sequestration is fundamental to ascertain the role of old forests as sources and sinks in global C.
To analyze the effect of the balance between growth and mortality of species and hardwood-softwood mix on the C source and sink budget of old forest types in New Brunswick, Canada. A set of 602 plots, representing 12 stand types, were grouped into softwood (SW), mixedwood (MW), and hardwood (HW) categories. Net C change per year, including growth, recruitment of trees, and mortality, was calculated, and plots were categorized into three classes, of carbon sinks, sources, or neutral. Over the period from 1987 to 2007, 68% of plots were C sinks, 25% were sources, and 7% were neutral. Balsam fir-spruce (Picea sp.) was the only stand type with negative mean C change at − 0.2 t C ha−1 yr−1. Long-term C projection using OSM (open stand model) determined that shade-tolerant hardwood and mixed stand types showed increases of 26–30% of total C over a 100-year simulation, whereas other stand types ranged between 7 and 21% increases. Balsam fir-dominated stands incur high mortality rates due to shorter longevity (stand decline) and high susceptibility to insect and wind disturbances, and therefore, HW and non-balsam fir-dominated MW should have priority in management for longer rotations to maximize C onsite. We thank New Brunswick Department of Energy and Resource Development (formerly named Department of Natural Resources) for PSP database access and support. DAM and AB conceived and designed the study; AB performed research; AB, DAM, and CRH analyzed data; and AB, DAM, and CRH wrote and revised the paper. This work was supported by funding from a Community University Research Alliance project led by Dr. Don Floyd, with industry support from J.D. Irving, Limited.